Benoit: I chose it because it is a beautiful country and there are less people than in Australia. Also, the visa was very easy to get. Anthony: We also considered Canada, but it was not a guaranteed for us to get a visa. Australia has too many backpackers. And Kiwis had great reputation of being kind and helpful. They did help us a lot with our English. Can you explain to other travellers what is a Starter Pack? Anthony: It makes our trip very easy. It was also a way to reassure our parents too. They were very stressed about or trip so it made them feel safe to know that we had support. For example, they helped us with: a problem with our Kiwi Post, our phone, and even our bad level of English. They made everything easier. Even after the first few days, they were always here for us. If we had problem, we could call. Benoit: Yes it was great to reassure my parents to get a Starter Pack. It made it easier to convince them that it was Ok for us to go on this trip. If they were not here, they would not have let us go. Did you like your agency’s services? 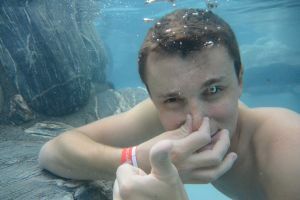 Anthony: Yes, everything went smoothly, our hostel was already booked, the shuttle waiting for us at the airport, and so on. Early on, they told us about WWOOFing which helped us a lot, as our English wasn’t great. Thanks to that, we met amazing people. Benoit: I liked the shuttle a lot. It was very personal and not cheap. It was a no-stress experience from the second we landed. I really liked the Sky Tower entry too. You took two weeks of English courses, how was it? Anthony: I had a big discount for this and the courses really helped us at the beginning so it was great. Benoit: I think that it was a very good school because we studied with many different people from various nationalities and we spoke a lot. Benoit: Before we arrived in New Zealand, we emailed a lot together. They replied to all my many questions. It was a great relief, as I really had a lot of them. Anthony: The best thing for me was having one personal support person. In the first few weeks we were so stressed and did not know anything about New Zealand and it was very important to have somebody to turn to. What was your favourite spot in New Zealand? Benoit: Abel Tasman National Park. It is simply beautiful with amazing beaches! 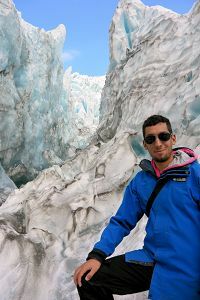 Anthony: Mt Cook! It has stunning mountains and awesome activities. We took a boat cruise on the Tasman Glacier Lake. It was mind blowing and not crowded. 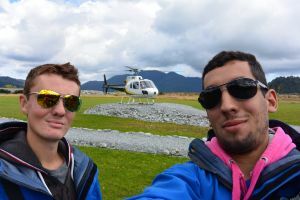 Anthony: The Heli Trip on Franz Josef Glacier. We did a walk for over two hours on the glacier, then went to the hot pools. It was amazing. And knowing that in a few years the glacier may disappear makes it even more unique. Benoit: We booked tickets to a Katy Perry concert at the last minute, only two hours before the show. It was VIP tickets and we had a blast. It was very unexpected. We came back to Auckland just for the show before heading back up North. What was your favourite activity around the country? Benoit: For me, it was Christmas with our WWOOFing family. We prepared the Christmas food with our family and spent the whole evening with them. Even if it was our first time away from home for Christmas, it was just like a second family. Anthony: I loved when we saw wildlife, especially rare ones! During our boat trip in Paihia, for example, we saw dolphins and even a beautiful shark. It was really great. Anthony: It was fine. Most hostels actually have good beds! We really did not want to sleep in a car or campervan for eight months. We even worked in a hostel in Greymouth – it was a fun job. Benoit: Sometimes, when our roommate was noisy, I had a hard time to fall asleep. But overall it was good. You guys stayed “only” eight months here, did you have enough time to see everything? Benoit: Yes! We went almost everywhere and we always stayed a few days everywhere instead of just staying one night. Anthony: It was the right amount of time. We saw a lot and I am ready to go home to see my family. Anthony: Now I want to study tourism so I am planning to go back to school. It is something that I never wanted to do. Then I want to keep on travelling a bit and maybe even come back to New Zealand. Benoit: I will go back to school to finish my diploma. Anthony: Yes, it made out trip much easier. And we met new friends to travel with thanks to them. Benoit: Yes, because they replied to all my questions and there were no stress and no problem. They were here for us!